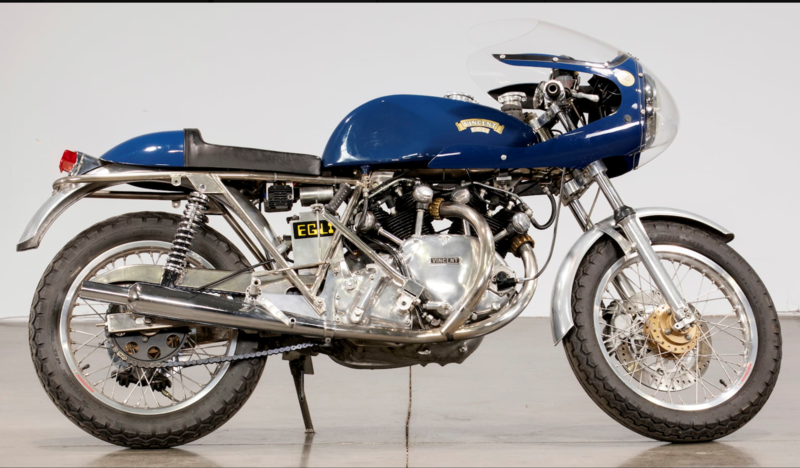 This page is dedicated to the Egli-Vincent and other Vincent specials offered for sale around the world. By publishing these adverts, I do not endorse in any way the sellers or their representants. When necessary, I will add my own comments based on the information publicly provided, however as for any large cash outlay, please ensure you make your due diligence preferably with the assistance of a brand expert during the purchasing process. 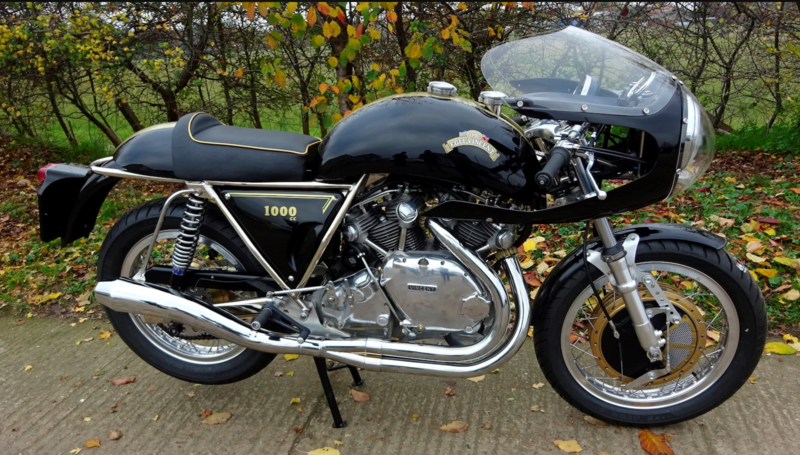 Black and Gold, 1200cc. REG 1969 with only 700 miles. 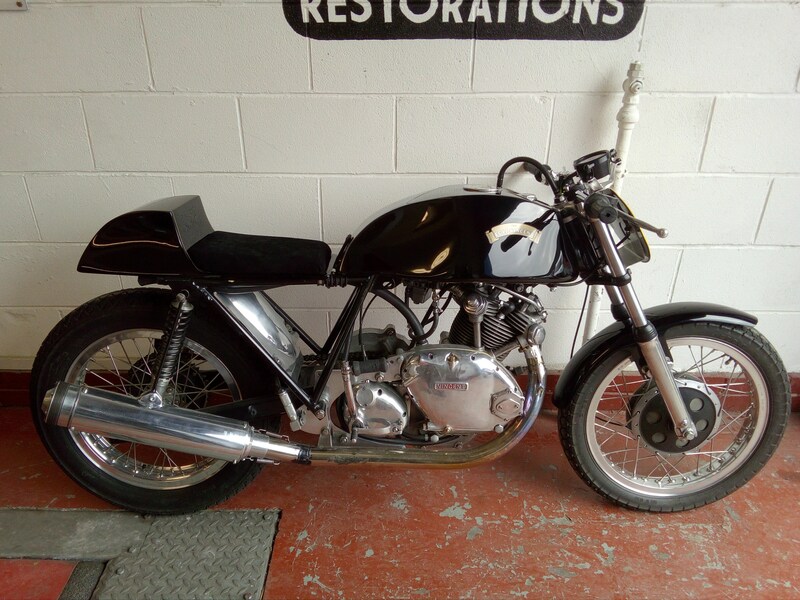 5 speed gearbox, Ceriani front Forks, Fontana 4LS front brake, Fontana TLS rear brake. Very little is known on this bike. No mention of the origin of the frame nor if the bike comes with a title. 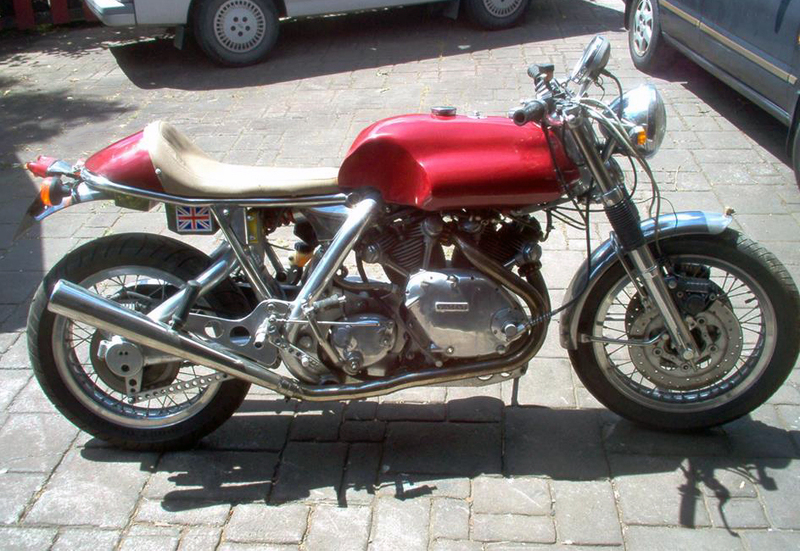 This bike built by John Mossey (chassis RS411182 and engine F10AB411182). It is a 998cc and will likely turn up to the next auction. Stay tuned it you are interested. The frame and swinging arm (nickel plated) was built by Cyril Malem (CTG). the Borrani rims are wired with stainless Steel spokes on Dunlop K81 tyres. The front fork is a Ceriani GP. Brakes Fontana front brake 4LS (magnesium). Alloy control levers. Vincent Rear hub (alloy). 5” Vincent Black Shadow tachometer. 3” speedometer (Smith replica) with MPH scale. Banana tank (fiberglass) with internal resin treatment and aluminum Monza cap. Fiberglass seat. All the fasteners are Stainless Steel. Owner says the bike is 100% operating and immaculate. Asking price is 25,500£ (28,500€). 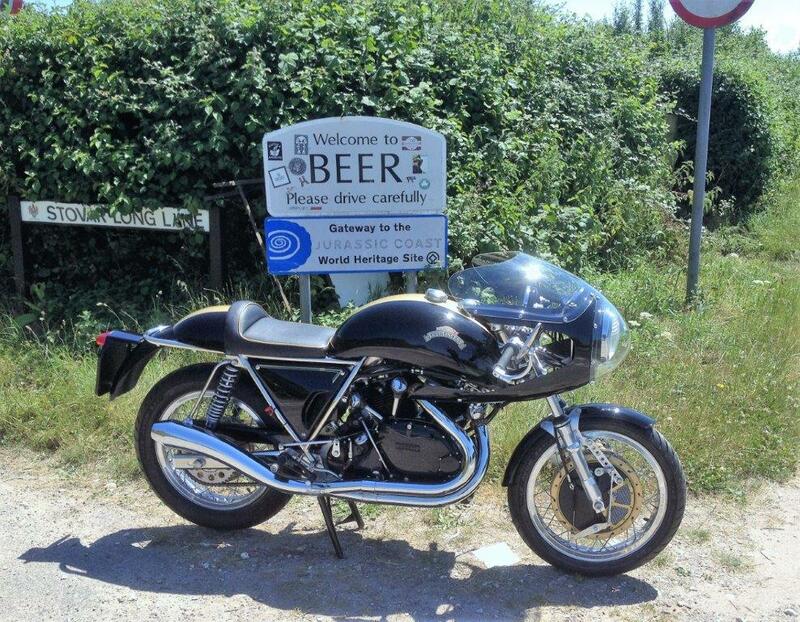 Possibility to trade-in a Vincent Rapide (C series). EV Racer built with possibly a Andy Sidlow frame (TBC) and a 1952 Rapide chopped engine (F/10/AB/1/9670) matted to Norton gearbox. Built it in the uk in 2001 by Chris Knibbs and exported to NZ in 2006 – It has been compliant in both countries. 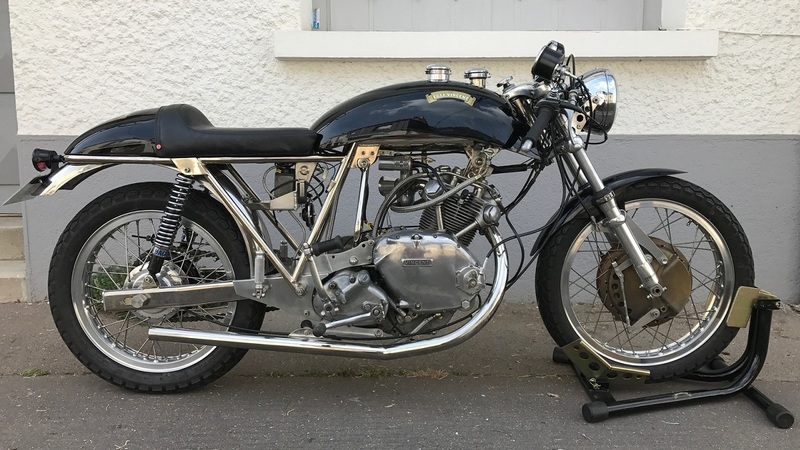 The bike has two front heads, a Norton commando transmission with RGM belt drive, electronic ignition, Kubota alternator, Moto Guzzi front end, Norton Commando rear hub, flanged rims with stainless spokes. gearbox has outrigger bearing tied to crankcases, no tensioning required so no slots and drawbolts. 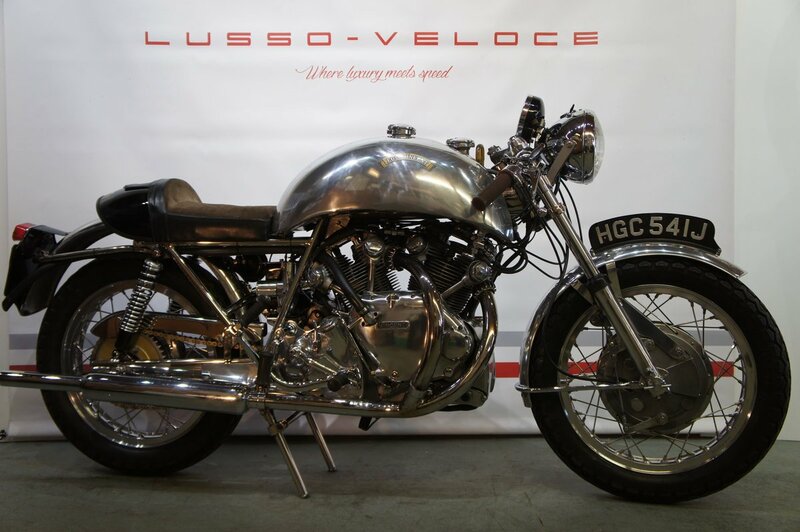 Aluminium frame, swing-arm, seat, tank, stainless exhaust and pipes are custom-made. A million other parts: 5in tacho-chronometric and cycle speedo. Chris says it is a good usable bike probably overdue a freshen up but other things to do, reflected in the NZ$55.000 (about $38,000 and 35,000 Euros and £29,000). The Red Rocket was built by the late Al Mark here in So. Calif.
You have an interesting and useful site. It would be interesting to see a running list of actual sale prices to keep an eye on current values. Great site. I love it. 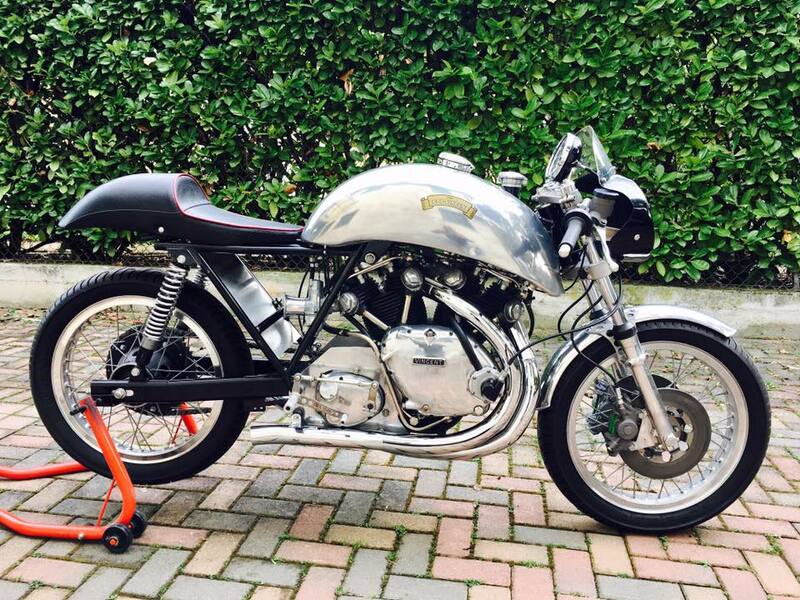 I’m looking at a Vincent Black Shadow in Germany but have to be very careful. Je vais malheureusement me séparer de mon Egli, pourrais tu me dire comment procéder pour poster une annonce sur ton site. Oui. Il me faut une photo, une description aussi précise que possible, les numéros de chassis et moteur, le prix demandé et comment vous contacter. Vu la recrudescence de scams et le fait que l’on vient juste s’être contacté par deux scammers (gonflés) me demandant de publier leur fausses annonces sur le site (et donc dédouaner des véritables scams), je demande maintenant une preuve de propriété (copie de carte grise) juste pour mon dossier et non publiés. Merci de me prevenir quand c’est vendu. How do I put my J mossey built 1200 egli on this site? It has just 5 miles on it and at 72 find it not the best riding position.